Surrounded by three sides of sparkling sea, Turquoize grants guests an exclusive adults-only getaway within Mexico's most coveted all-ages resort. The lavish suites, featuring oversized balconies with private tubs, overlook the resort's best seascapes and include butler services, private transfers and VIP access on top of Hyatt Ziva Cancun's extraordinary amenities. 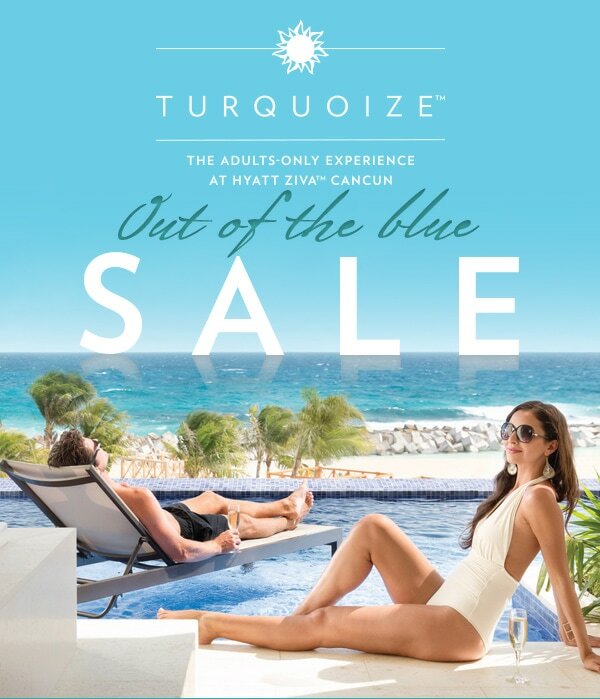 Offer valid for reservations made in advance between now and 07/15/2017 for stays from now and 12/20/2017 at Hyatt Ziva Cancun. A limited number of rooms are allocated to this offer; reservations subject to availability. Offer not valid with groups, conventions, other promotional offers, tour packages or special rate programs. Rate is per room, per night, based on double occupancy and excludes service charges, mandatory resort fees, applicable taxes and other incidental expenses. Additional charges may apply for additional guests or room type upgrades. Promotional blackout periods may apply due to seasonal periods or special events, and normal arrival/departure restrictions apply. Hyatt reserves the right to alter or withdraw this offer at any time without notice. Hyatt Zilara™ and Hyatt Ziva™ trademarks and related marks are trademarks of Hyatt Corporation or its affiliates. ©2017 Hyatt Corporation. Playa Hotels & Resorts, an authorized operator and owner of Hyatt Zilara™ and Hyatt Ziva™ resorts in Jamaica and Mexico. All rights reserved.